Occasionally I’m asked a question by a reader that really makes me think. One that makes me immediately say to myself: Goodness, I don’t know the answer to that question. But the cool thing is that while I truthfully don’t know the answer, I do know where to find the answers to life’s questions. So I turn to God’s Word and read and study- praying for the Lord to show me the answer. Thanks for the post. The reminder to leave my burden at Jesus’ feet is one that I’m really working on right now. Sometimes, though, I really am not sure how I’m supposed to do that. What does it look like, practically speaking, to leave my burdens at His feet? Do you have a specific example of a time in your life when you did this? 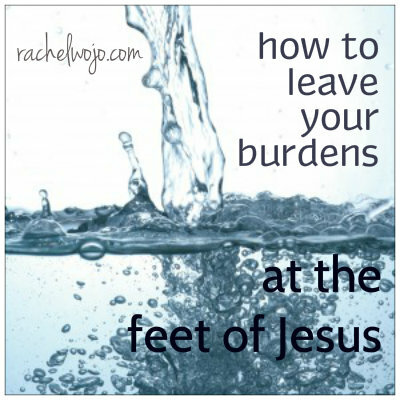 What is the answer as to how to leave your burdens at the feet of Jesus? Think for a moment of a pitcher filled with water. This pitcher represents our life and the water represents our burdens. Wow- that pitcher sure is heavy when filled with all the burdens! So we go to time with God and pour some water out of the pitcher. We talk to God about our burdens and we attempt to listen to what He is telling us. But the pitcher is so heavy, we tire of holding it. And while much of the water (our burdens) remains contained in the pitcher, we walk away from our time with God, carrying the burdens with us. A little while later, maybe hours, maybe days, we return to the Lord in conversation with our pitcher of burdens still in tow. And that pitcher seems even heavier than before because of the weight. But instead of relinquishing it all to God, we carry our pitcher back out of our time spent with Him. Lugging the weight of burdens like we enjoy it- though we claim it to be our worst enemy. Hannah gives us a wonderful description of what she did with her burden. She poured out her soul before the Lord. She wasn’t about to walk away until she told God everything on her heart regarding the matter. She wasn’t about to leave that place until she had spent every ounce of her energy, strength and dignity explaining her need to God. Hannah took her water pitcher of burdens and poured it out. Every last drop. She held nothing back and stood before God, holding her water pitcher upside down, with tears falling from her cheeks, as she dumped it all at Jesus’ feet. Hannah’s pitcher was bone dry. To answer the last part of our reader’s question, yes, I do have an example of a time when I poured out my soul to God. I’m running out of space and time to answer this portion of the question in this post, but when you’ve gone through divorce, lost your mama to cancer and find out your daughter has a terminal disease, then at that point, you have nothing left but to pour out yourself before the Lord. I guess the part Hannah’s story doesn’t help us with is that no one talks about the automatic refills. After we have poured out every drop to God, what happens when another burden fills the pitcher? We pour out again. And again. And again. Because His love never fails, it never gives up, it never runs out on me. Or anyone who comes to Him, ready to pour themselves out completely and allow Him to fill the empty spaces in totality. Have you ever poured out your soul before God? 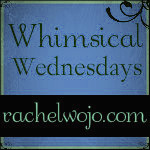 Bloggers, it’s Whimsical Wednesday- our link-up party day. 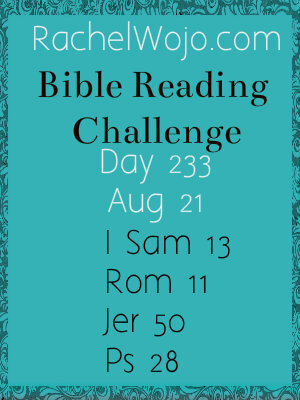 Thank you for linking up your encouraging posts! Wonderful post Rachael. I especially love these words: “His love never fails, it never gives up, it never runs out on me.” I think this is my first time to link up. I’m glad I found you! Rachael, I didn’t know that one; it’s beautiful. Thanks for introducing me to the song! 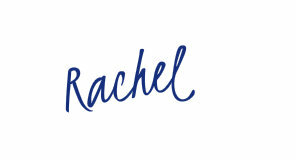 Rachel, I LOVE this! I would like to reblog it to my site with proper links back to your site if you’ll allow me to. Great post! May we pour ourselves out to Him! Thanks for hosting & God bless. Thanks for linking up, Laurie!! This message was right on time. I needed to read this. Thank you for your spiritual word and the ones to follow. God bless you. Bless you, Shea. God has such a way of providing what we need at just the right time. I love His perfect timing- hope you have a great day today! Thanks for linking up, Amy. Praise Jesus for the inspiration to flee to Him. Have a great day!